Pain-Shurado the Asura Path of Nagato is one of the strongest taijutsu user. This path is channeled by Nagato through the body of wandering puppeteer. The strength of Pain-Shurado was shown when he easily ripped of Jiraya’s arm and crushed his throat. Moreover, there are various mechanism from different parts of Pain-Shurado’s body. Let’s take a look at Pain-Shurado abilities. Taijutsu Wrist Fire Arrow[Prompt]: Cause Taijutsu damage to the selected opponent’s unit, Ignition and Interruption. Taijutsu Taijutsu Attack: Attacks the opponent’s front row and has a chance of 3 COMBO and High Float. Ninjutsu Internal Weapon: Chases and Attacks a High Floated unit, causes Ninjutsu damage and Repulse and, triggered twice at most each round. Taijutsu Five-Finger Flying Bomb: Chases and Attacks Low Floated unit, causes High Float with High Combo and Ignition. Ninjutsu Rinnegan – Taijutsu: At the beginning of a battle, all Rinnegan attribute units in your field will have their Attack increased by 40%, lasts for 3 rounds. You can get Pain-Shurado from Tendo Treasure and Rank Battle Shop. 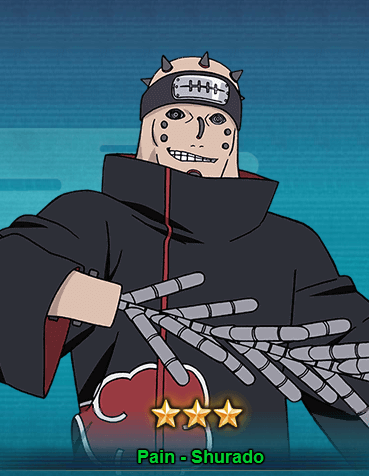 Like other Pain ninjas, you can get Shurado for 40-60 seal scroll draws. As for the Ranked Battle shop, you can get 2 fragments of Pain-Shurado for 1000 points.